Kingswinford, West Midlands, The Old Crown Pub, c1910. The pub is now called 'The Horse and Jockey'. We must consider ourselves lucky that the building survives, though much altered. This is a particularly fine postcard, published by Skelding of Kingswinford. 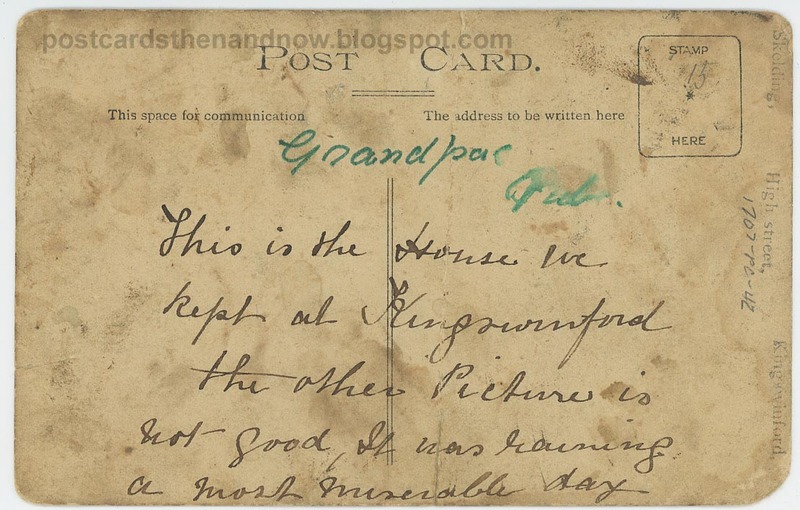 There are two messages on the back, the older one says 'This is the house we kept at Kingswinford, the other picture is not good, it was raining. A most miserable day'. I do not have a copy of the other photograph. 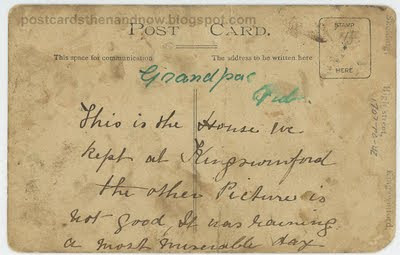 A later hand has written 'Grandpa's Pub'. 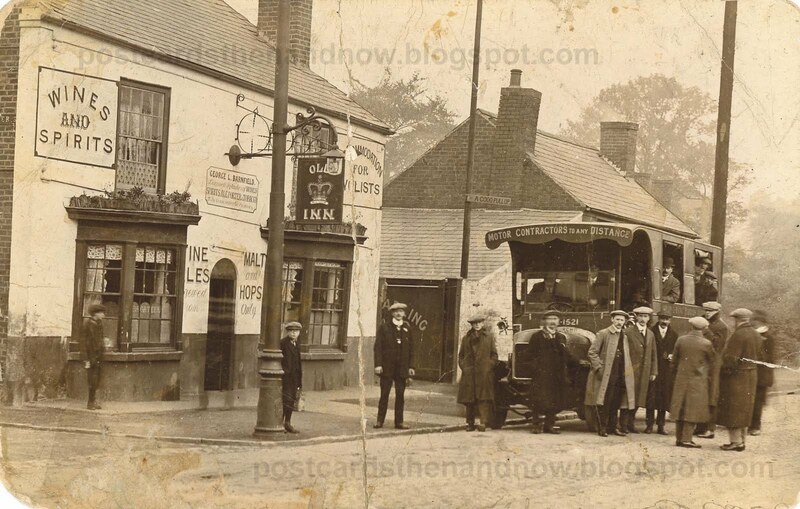 Who knows why the day was so miserable, but it looks like the primitive coach is taking the pub regulars on an outing somewhere. For more old photographs please visit Sepia Saturday. As always click the pictures to enlarge. Edit - July 31 2011 - The original Google Street View for this exact location no longer works, so I've replaced it with one taken a few metres away. Wonderful card, what a shame they didn't write who Grandpa was! Oh great a grandpa with a pub. I had a grandpa who kept a pub in funds - by frequenting it so often! Perhaps they were off to a darts match. That's a great card. I wonder how many that coach holds. It doesn't look like there is room for all the men standing outside of it. Such a great old building and interesting history. 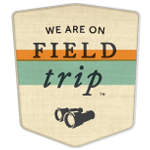 What a super idea to compare these old post cards with street view, well done! That is a wonderful picture, so clear and sharp when I clicked to enlarge it. I really do like how you compare the now and thens too. Thanks so much for stopping by to say hello. I hope that your week is wonderful! A football coach perhaps? And today they just watch it on the Sky Sports. I like the little sign - "a good pullup"
I like to compare old photos to google view too. all too often the building is now a vacant lot or parking lot. What a lot of information there is in the single view. A great vehicle too. What a wonderful image. It's always fun to see people in environments; a place and time captured. This one is great! Oh this is a fantastic place...love to stop by for a brew here! Aren't these old finds just the greatest things! Sadly this pub may have been "raised to the ground" after the licence expired in 1925. It was on the corner of Water Street & High Street Kingswinford. The licensee in 1910 was either Richard Cardo (1908-1910) or Arthur Poultney (1910-1911). "Black Country Bugle (April 1984) ‘Wallheath Then and Now’“There is a legend that the HORSE AND JOCKEY was so named because its first proprietor rode the winner in the Mile Flat Stakes and was so handsomely rewarded by the animal’s owner that he was able to finance the public house with the proceeds.”.